NB: Not sure how to access Customer Focus Ultimate? If you're in the UK / Europe, click here. If you're in the US, click here. 2. Next, select who the store is for. If you select 'My Company' you can still modify the site details fields below, however in the first instance these will be auto-populated with the company details built into Vision for your company. If creating a Store for a Customer or Prospect, it's a good idea to have already created the customer record and assigned a logo to their account. You'll see that you can choose a default logo for both the header of the website, and to appear on products using our Virtual Sample technology. 3. Now you're going to select the website template you'd prefer. The choices are on the left. Click on any of them to see a larger preview, and don't forget that you will be able to make extensive edits after you have created the site. On the right, you can select which catalogues to display as part of your store. These can be selected from a drop down menu when clicking on the calagoues field, as shown below. Note that you must be subscribed to each of the catalogues in order to use them as part of your Store. 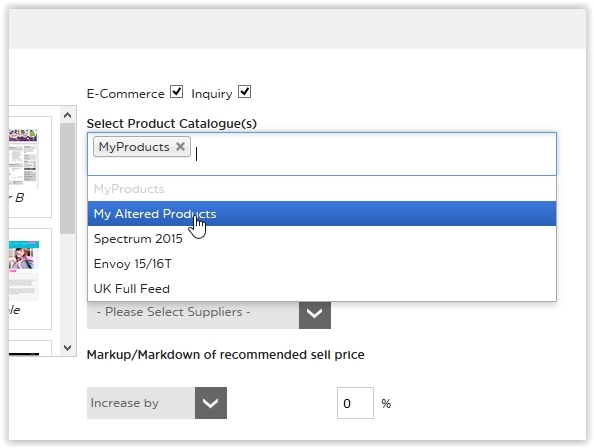 Additionally, if no catalogues are selected the field will default to just 'MyProducts'. Next, choose your vendors from the drop down list; you can just select 'All' if that's easier. 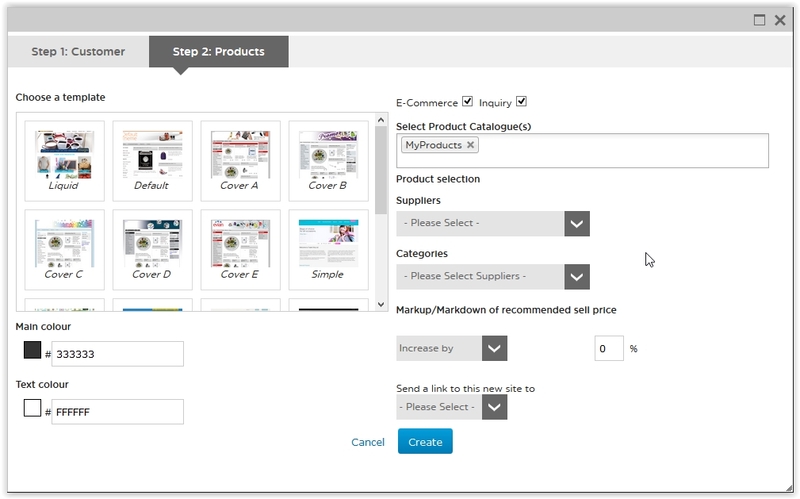 Once you've done that, you can choose which product categories to show. Again, whatever selections you make here can also be made after the site has been created. You can also adjust the price margin on the website here. Just use the drop down menu to increase or decrease the margin. Finally, you can choose to send the link to the website to your customer right away; or, you can make further edits to the website once it's created, and send the link later. 4. After a few seconds you'll see a pop up message telling you that the site has been created. You can now access your new website by clicking on 'View Website'. To make edits, just click on 'Manage' from the Website Overview page.